Google's latest answer to this challenge for the Nexus 7 (2013) is the folio case - essentially a bumper with a folding lid. The folding lid also has a magnet to wake/lock the device, and to lock into a triangular formation for stand capabilities. I've spent about a week with the folio case to try and get a handle on it as a product - is it worth its price? How does it hold up? And finally, can it convince someone who doesn't normally use cases - like myself - to use a case? Let's take a look. Putting Google's naming scheme aside for a moment, the first thing you'll notice about this case is that it doesn't have a back. More than anything, the case is a bumper with a folding magnetic cover. The case comes in either black or a blinding orange/red/tangerine color similar to the Nexus 5 bumper case, the official Nexus 10 book cover, or Tangerine Glass. 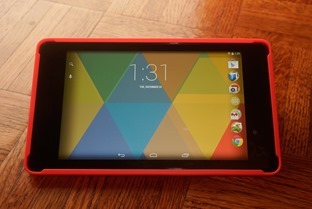 It's a pleasing color, but it's good that Google offers black - bright orange is definitely not for everybody. 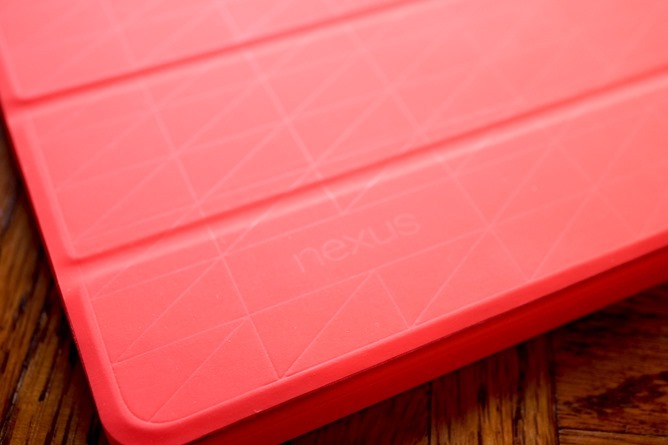 Also worth noting is the subtle pattern embossed on the front of the cover, and the barely-there Nexus logo. 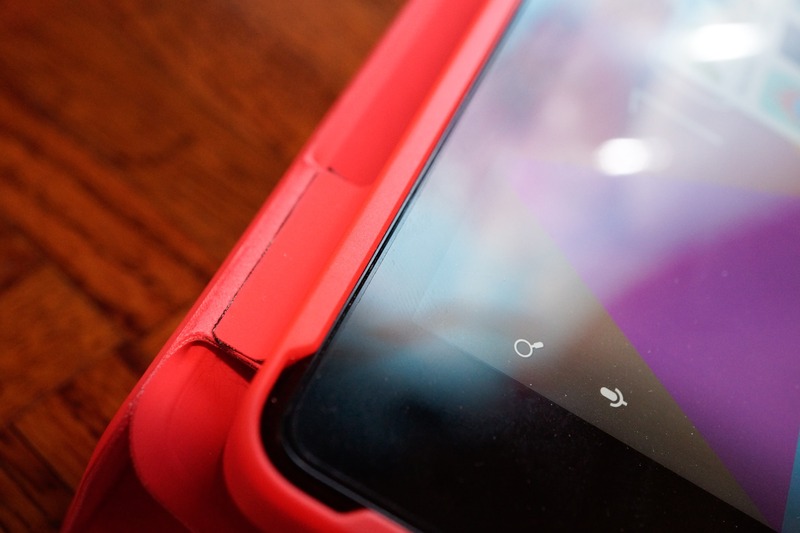 Like its Nexus 5 counterpart, the official case squares off the edges of the device a bit, eliminating the multi-part curve that's supposed to make the device such a pleasure to hold. That isn't to say that the case ruins the feel of the device - in fact, the Nexus 7 is just as nice to hold as it is without the case. 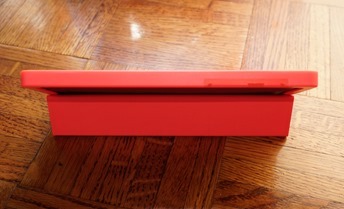 The folding front is attached to the bumper by small flexible hinges. What strikes me about this case is that it seems to have been more thoughtfully designed than the Nexus 5 bumper cases - it's more flexible, has a more intricate internal structure, and the buttons actually work! Speaking of the buttons, they're on their own special chamfered section on the side of the case, to line up with their slightly downward orientation on the device itself. This plastic is much thinner than that found on the other parts of the case, and extra care seems to have been taken to ensure the buttons will actually react and cause a noticeable clicking action when you press them. 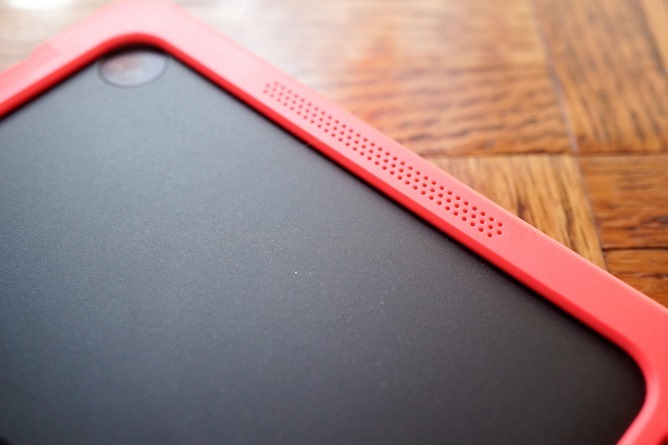 The same could not be said of the Nexus 5 case, unfortunately, so this is a refreshing change. Otherwise, the case has holes for the two speaker grills, microphone, 3.5mm jack, and of course the charging port. As you might expect, the actual function of the case is exceedingly simple. Open it or close it and the device will wake up or go to sleep, respectively. This is thanks to a row of embedded magnets plus one larger magnet. There's another row of magnets on the opposite side of the cover that will lock it into place in stand mode. This, like Apple's smart cover and all other folding covers following it, allows for two viewing angles, and supports the tablet in a way that feels fairly secure. The hinges are flexible enough to let you fold the cover all the way back, should you desire. Really that's all that can be said about how it works. It functions as you'd expect, and seems fairly sturdy. This part is kind of tricky. In general, I actually like this case. As I've said numerous times, I don't normally use cases, even with tablets (I'd much rather opt for a sleeve like the Dodocase Durables). 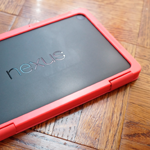 But I've had the Nexus 7 folio case for over a week now and I'm probably going to keep using it for the foreseeable future after this review is published. It's a decent, functional case that doesn't spoil the device's form factor (though it does square off the edges a bit), and it's nice to look at. But fifty dollars is a bit much. As good a case as this is, I can't honestly say it's really worth $50 unless you're absolutely committed to getting only official accessories. There are certainly less expensive alternatives out there that would get the same job done. But, since I've already made the purchase, I'm perfectly happy with the case. 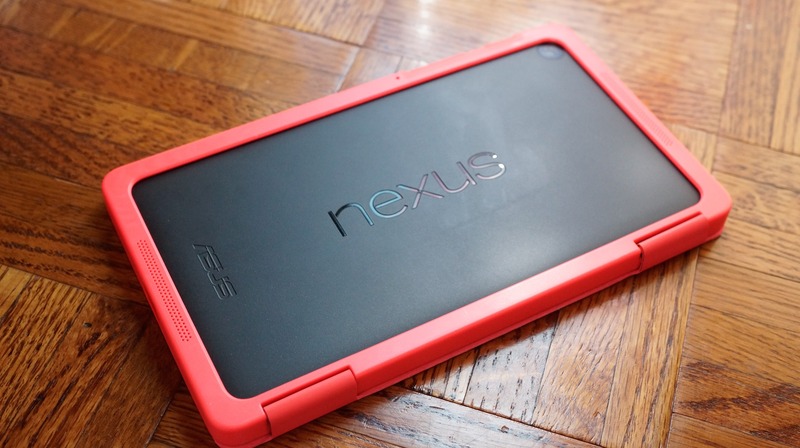 If you've got $50 to burn on a tablet case, it's definitely not a bad choice.